The weather is cold and it’s been snowing. Even though I don’t particularly like cold weather, I do appreciate the quiet and beauty of falling snow. This art project is simple and I expect to see a wide variety of interpretations of the directions. I like using silhouettes because the images don’t have to be perfect. You can find the directions for this art project in the 5th Grade Projects Gallery in the sidebar. Click on the image above for a close up look at the art project. 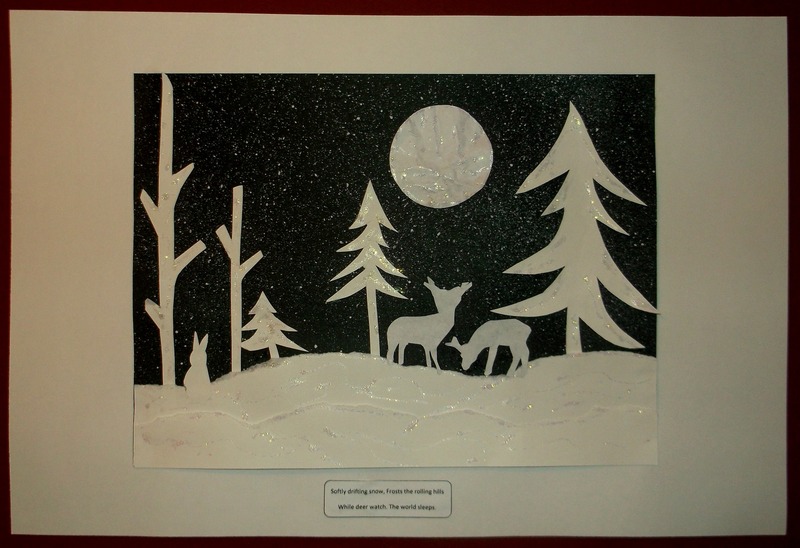 This entry was posted in Categories and tagged 5th Grade, art project, black, calm, deer, silence, silhouettes, trees, white, winter. Bookmark the permalink. I like this! It is something my class will enjoy doing!